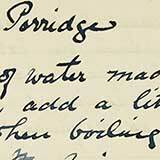 Oats have been the staple food of Scots for centuries. 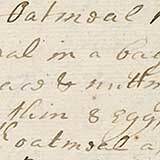 In the 14th century, French chronicler Jean Froissart noted that Scots soldiers carried bags of oatmeal to make their own oatcakes. They cooked thin flat oat cakes on metal bakestones over the open camp fire. 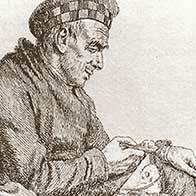 In the Middle Ages, bere and barley were more widely cultivated than oats, especially in the Highlands. It was not until the agricultural improvements of the 18th century that energy-giving oats became the dominant cereal. Wheat is grown in Scotland, but generally the soil and climate do not favour its cultivation. Wheaten bread was for long a luxury item for the wealthy, while in the Highlands the poor ate potatoes as a substitute. Today most of us eat wheat bread — although oats are enjoying a revival in popularity and seem likely to become a global superfood. Porridge is a Scottish staple associated with hearty winter breakfasts. 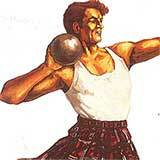 Scott's Porage Oats introduced their iconic kilted highlander in 1924 as a figure of strength, health and vitality. 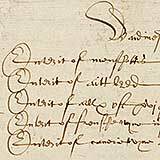 Bread is usually the first entry each day in the Earl of Angus's household accounts for 1608. 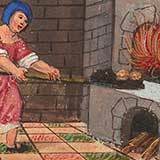 Although many bought in baked goods, large houses often had their own bread ovens. Bread was baked in large quantities for lairds and their families. French Bread is a rich wheaten loaf with eggs, butter and milk popular with the well-to-do. 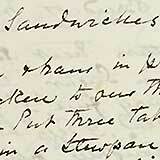 Sandwiches are said to be named after an 18th century Earl of Sandwich. 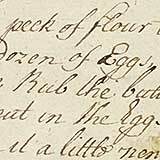 Spicy puddings sweetened and flavoured with rosewater and sack were popular in the 17th century. 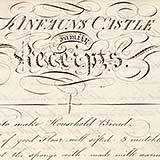 Except where otherwise stated, all content is © National Library of Scotland, and is available under a Creative Commons Attribution (CC-BY) 4.0 International Licence.